Tor Browser must be kept updated at all times. If you continue to use an outdated version of the software, you may be vulnerable to serious security flaws that compromise your privacy and anonymity. When you are prompted to update Tor Browser, click on the Torbutton icon, then select “Check for Tor Browser Update”. 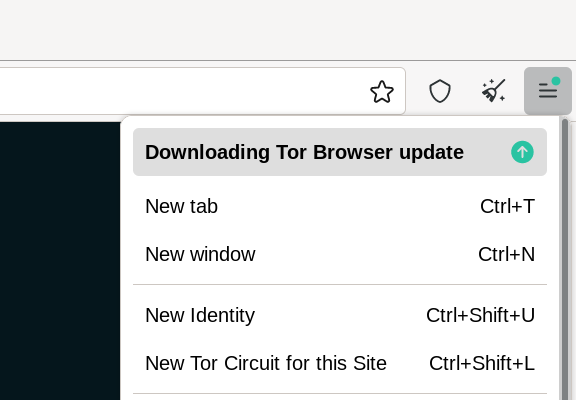 When Tor Browser has finished checking for updates, click on the “Update” button. Wait for the update to download and install, then restart Tor Browser. You will now be running the latest version. When you are prompted to update Tor Browser, finish the browsing session and close the program. Remove Tor Browser from your system by deleting the folder that contains it (see the Uninstalling section for more information). Visit https://www.torproject.org/projects/torbrowser.html.en and download a copy of the latest Tor Browser release, then install it as before.